1.There have been changes to the packaging of your Formulas and Toddler Milk Drink. Has there been a reformulation? Our Step 1 Infant Formula and Step 2 Follow-On Formula now contain long chain Omega 3 & 6 fatty acids – DHA & ARA, as well as prebiotic, Galacto-Oligosaccharides (GOS). Our Step 3 Toddler Milk Drink also has the addition of DHA to its formulation, whilst still providing 16 essential vitamins and minerals to support good health. Step 1, 2 & 3 are all still made from certified organic cow’s milk, blended with the essential compositional requirements including vitamins and minerals as set by Food Standards Australia New Zealand (FSANZ). 2.What changes have been made to the formula and milk drink packaging? 3.Does your formula contain the key nutrients required for an infant up to 12 months of age? Yes! All infant formulas in Australia must comply with a strict recipe as dictated by the Food Standards Australia New Zealand (FSANZ) and must meet all the complete nutritional needs of babies for the first 12 months of their lives. Our formulas meet these standards and we pride ourselves in the quality of the products we create. 4.What is the difference between Step 1 Infant Formula and Step 2 Follow-On Formula and why have the age specifications changed for Step 1? Both our Step 1 and Step 2 are comprised of key macronutrients, vitamins and minerals to support the growing needs of an infant in their first year of life. The fundamental difference between the two is in the type of protein. Step 1 is a whey protein dominant formula which is easier to digest. Step 2 is a casein protein dominant formula which may take longer to digest and can create satiety in your baby, particularly as they commence on solid foods from around 6 months of age. In addition, an infant’s iron requirements increase from the age of 6 months. Our Step 2 contains more iron than our Step 1 to accommodate for this developmental requirement. Step 1 now indicates 0-6 months age specification however can be used up to 12 months in line with Food Standards Australia New Zealand. Parents and carers are able to choose which formula is designed to meet the specific nutritional needs of their child. If you have any queries about the suitability for your baby, please consult a health care professional. 5.Why do Step 1 and Step 2 formulas contain less protein than before? 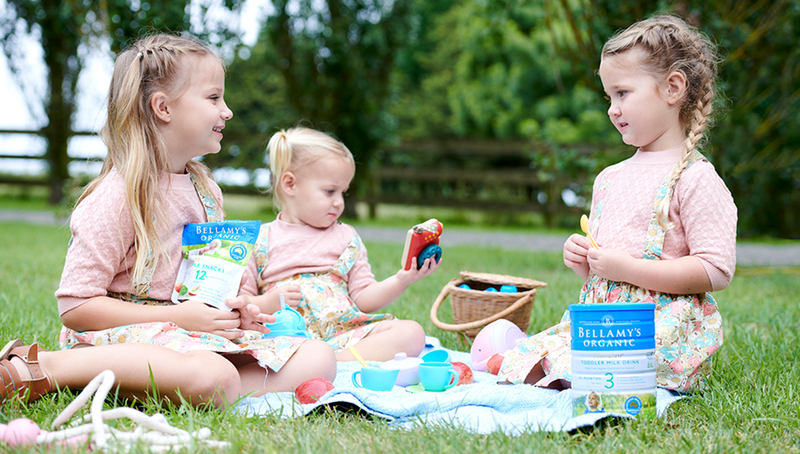 Bellamy’s Organic prides itself on producing the highest quality infant formula that complies with the essential compositional requirements of the Food Standards Australia New Zealand (FSANZ). The new formulation includes reduced protein levels so that our formula aligns with current research recommendations and FSANZ. 6.Palm oil has been used in your formula. Where is this sourced? We only use certified organic palm oil from sustainable sources in our infant formulas. Our palm oil is from South America and is from the only company in the world that has a vertically integrated palm oil production system from seeding to farming, harvesting, mechanical pressing, and physical refinery and finally making of products including the palm oil. The palm tree plantation is committed to improve the living conditions of the local communities and is sponsoring the development of an additional 2,000 hectares owned by cooperatives of small farmers. This is an important project of great social impact in the region and part of their commitment to organic farming practices. We use palm oil in our infant formulas, which help to provide the correct fatty acid composition. Palm Oil is used to supply palmitic acid. Palmitic acid is a fatty acid which occurs in significant levels in breast milk and palm oil is the best source for supplying this fatty acid to formula. We choose palm oil over other oils, because of its high quality, health conscious food processes and it does not contain excessive amounts of trans-fats derived from hydrogenation like in animal fats. Our palm oil is not sourced from Indonesian rainforest and does not have any impact on orangutans. 7.Can I receive samples or smaller sizes of your formula or milk drink? The World Health Organisation recommends that breastmilk is best for your baby. The introduction of infant milk formula can be hard to reverse and should only be used after advice from a doctor or health practitioner is sought. In recognition of this, Bellamy’s does not provide formula samples. 8.Do your formula & milk drink tins contain Bisphenol A (BPA)? Our tins, lids and scoops are all BPA free, and recyclable. 1.With the changes to the packaging of your food products, have there been changes to the ingredients lists? Whilst mostly we have kept all ingredients the same for our rebranded products, there have been some small changes to ingredients of some products to enhance taste and overall quality. This may be illustrated for example in the way we describe ingredients such as fruit to puree. Small changes in the percentage of ingredients can be seen in some products and has been clearly accounted for in the nutrition information panels of that product. In addition, some of our ready to serve products have had some ingredients removed such as spices and tamari. As a result, the ingredient list has been simplified and the label easy to read for consumers. 2.What changes can be seen in the packaging of your food products? New Nutrition Information Panels (NIP) with revised figures to accommodate for any changes in recipes. The NIPs have also been recalculated with the most up to date ingredient specifications. Our Peach and Apple pouch has been renamed to Grape, Apple & Peach to acknowledge grape as a key ingredient. Mango, Blueberry and Apple pouch as been renamed to Blueberry, Mango & Apple to acknowledge “Blueberry” first in the name as the principle ingredient. Apple, Strawberry and Mango Pinkies have been renamed to Apple, Strawberry, Sultana & Mango Bars, to more accurately describe the ingredients and product. 3.There are some food products that I can no longer find in store. Which products have been discontinued? 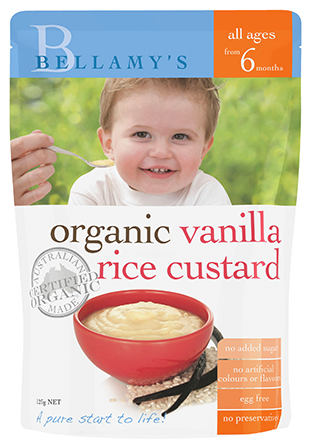 4.There are new products in the Bellamy’s Organic range. What are these new products and when will they be available? 5.Where can I find out more information about allergens in your products? 1.How do you read the new Country of Origin Labelling on your formula, milk drink and food products? All products manufactured by Bellamy’s Organic from July 1, 2018, will contain a standardised Country of Origin logo which satisfies Government Labelling requirements whereby the average percentage of Australian ingredients used in that product will be visible. This will be positioned close to the nutrition information panel on all our product ranges. All Bellamy’s Organic products are proudly Made in Australia and therefore this will feature on each of our CoOL logos on pack. 2.Why don’t you source all your ingredients from Australia? We have a commitment to source the purest ingredients to make our Bellamy’s Organic products and where possible we endeavour to source these ingredients within Australia and Australia is always our first choice. However, sometimes we cannot source enough organic ingredients from Australia that meet our strict requirements, or some ingredients may not be available in Australia due to our climate (e.g. drought and flood). Any imported ingredients we use go through our stringent quality procedures and are certified organic and approved by NASAA (National Association for Sustainable Agriculture in Australia) and ACO (Australian Certified Organic), which is Australia’s principal certifying bodies for organic and biodynamic produce. All our products undergo testing to ensure our products meet stringent food safety and quality requirements and we do not release any product until all of these tests have satisfactorily met these requirements. 100% of our fresh milk is sourced from certified organic farms in Australia. 3.Where can I find out more information about the origin of ingredients in my formula, milk drink or food products?